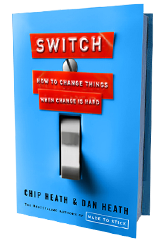 Rachel read Switch: How to Change Things When Change Is Hard by Chip Heath and Dan Heath. Recently we’ve seen a wave of literature about change on bookshelves and in journals. The latest from the Heath brothers (authors of the bestselling Made to Stick) explores why it’s so difficult for us humans to change and offers a framework for thinking about how to make it a little easier. With ample stories about individuals’, organizations’ and communities’ triumphs and tribulations related to change, it’s an enjoyable read with a practical payoff. Whether you’re trying to support a change in yourself, a colleague, a loved one or a whole group of people, reading Switch invites a little patience and understanding while inspiring new thinking about how to achieve the change you seek. If you’re interested in learning more about Switch, make sure to join Allison Partners at the Chamber Annual Business Expo on November 2nd for our series of book talks. Switch will be the featured book at 6:00pm.